The City of Glen Eira was created in December 1994 out of the former cities of Caulfield and (northern part of) Moorabbin. After initially being run by three Government-appointed Commissioners, the new City elected the first Councillors for Glen Eira in 1997. For electoral purposes, the City is divided into three wards. 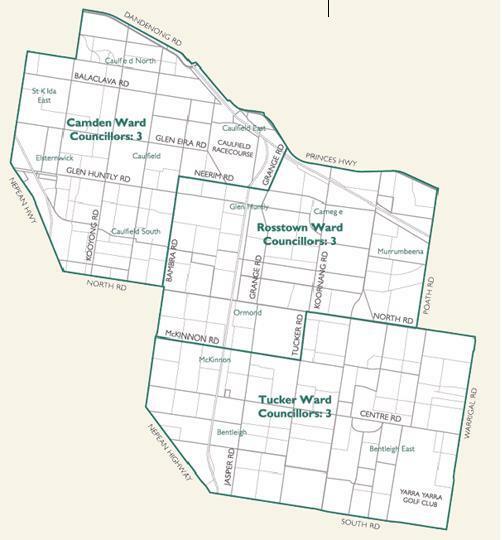 These are: CamdenWard in the North, Tucker Ward in the South, and Rosstown Ward in the centre. The present ward boundaries are shown on the ward map below.